Your system has run out of application memory. 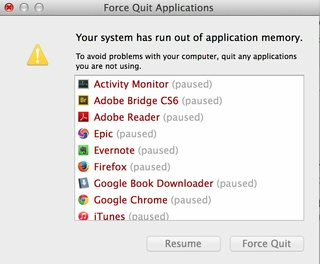 To avoid problems with your computer, quit any applications you are not using. I've obviously closed few which I could, but it didn't help. 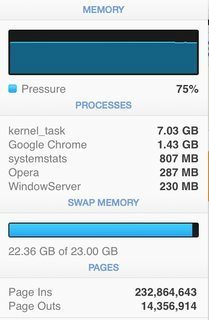 After checking on memory, it seems kernel task ate 7GB and 22.36GB swap memory was used of total 23GB (which obviously was the case). However I've still 20GB of space free on my SDD. Activity Monitor didn't help much whilst my OS X was heading to the destruction. Load Avg: 1.56, 1.62, 2.09  CPU usage: 3.51% user, 8.47% sys, 88.1% idle   SharedLibs: 46M resident, 0B data, 6572K linkedit. MemRegions: 757970 total, 2139M resident, 56M private, 907M shared. PhysMem: 9410M used (6198M wired), 556M unused. VM: 1155G vsize, 1311M framework vsize, 112872658(320) swapins, 122668389(0) swapouts. Networks: packets: 299419263/363G in, 142126838/14G out. Disks: 58970173/1079G read, 20012389/1120G written. At the end my OS X frozen and I had to do hard reset, repair my SDD in recovery mode and fixing afterwards (recovering lost work, fixing application conflicts, checking my lost+found folder, Chrome/Terminal tabs gone, headache, etc.). My question is, how do I check on high memory usage of kernel task or how to properly deal with that kind of situation? I've tried to take Sample with Activity Monitor, but it's greyed out. 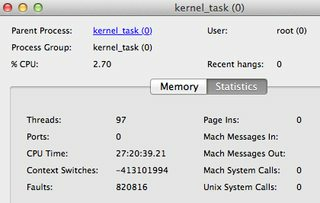 There are many things that go wrong with high kernel task usage. Usually this is related to faulty or heavy process which overusing system resources (such as indexing storage, running VMs, too many tabs in the web browser or some other background processes). Run Console.app and check on 'All Messages' to see if anything unusual currently is happening. Use Activity Monitor to read system memory and determine how much CPU, RAM and Disk is being used. Alternatively run top in Terminal and hold Space to refresh - easier to find the cause problem (swapins/swapouts/disks?). Run sudo fs_usage in Terminal to report system calls and page faults related to filesystem activity in real-time (I think this is the best option from all other). Then hit Control-C to stop it. Action: Consider killing apps which appears frequently on the list, but you're not using them. Learn more at: How do I debug an out-of-control “kernel_task” process? Run sudo syscallbypid.d (or syscallbyproc.d), wait a bit, hit Control-C. Now check which process generated the most system calls in that given time (last column) and if you recognise it, consider kill it. If not, Google it and learn more about it. Use sysdiagnose command (can be triggered by hitting Shift-Control-⌥-⌘-. (period) to quickly gather system-wide diagnostic information helpful in investigating system memory/performance issues (will appear in /var/tmp) either by you or Apple guys. During analysis, try to not do anything, when done - consider uncompressing the generated file and analyse the logs. See: How do you get system diagnostic files from OS X? Use spindump to profile entire system, it'll generate /tmp/spindump.txt file (including kernel and its extensions). Use vm_stat to show virtual memory statistics. E.g. vm_stat 1 # to display every second. It'll show the most wasting kernel zones. Note: On newer OS X (10.11 or above) this may not work when integrity protection is enabled (check by csrutil status). Try sar - system activity reporter which can sample and report various cumulative statistic counters maintained by the operating system. For more useful debugging tools, check for dtrace scripts (grep dtrace /usr/bin/*). If you know the faulty process which causing the problem, you may use dtruss to debug it. Here are some suggestions which can help you with the operating system issues. Its function is basically to terminate all the I/O pending operations which are using disk cache and then to free all the occupied disk cache, so it should free disk space to ease paging out and swapping out of main memory. It is safe to use, as it does not affect anonymous memory that has been allocated through malloc, vm_allocate, etc. Use some 3rd party apps to clear up some overused memory such as iBoostUp, SystemPal, etc. I had a very similar issue after replacing my LCD screen on a late 2012 iMac. Fan was running at high RPM and had high CPU Kernel_task usage. I narrowed it down to a Temperature sensor you must move from the old LCD screen to the new replacement screen. if you forget to do so the CPU speed and Kernel_task are affected slowing down your system. Not the answer you're looking for? Browse other questions tagged macos memory hang kernel-panic kernel . How do I debug an out-of-control “kernel_task” process? How to find out which process eats up memory? Activity Monitor not showing correct memory usage? How to Determine What's Using Filling GPU's Video Memory?